Richmond residents mourn Eric Brown, 21, of Richmond, who was fatally shot at La Moine Valley View Park on Monday night. Some groups in Richmond are coming together and others are clashing in the wake of a recent spate of shootings that has rocked the community. Richmond continues to make gains in reducing most crimes, but a deadly summer contributed to an uptick in homicides, according to year-end statistics released by police Friday. 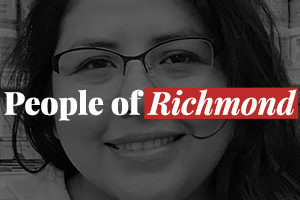 Friday’s ceremony to remember the victims of homicide in Richmond has become an annual exercise, as McLaughlin uses her monthly meet-the-mayor meetings every December as a solemn occasion to reflect on the lives lost to violence in the city. The longtime Richmond Congressman toured Richmond’s communications center to get a close look at Shotspotter, the gunfire detection technology to which he has steered about $1 million in federal funding.